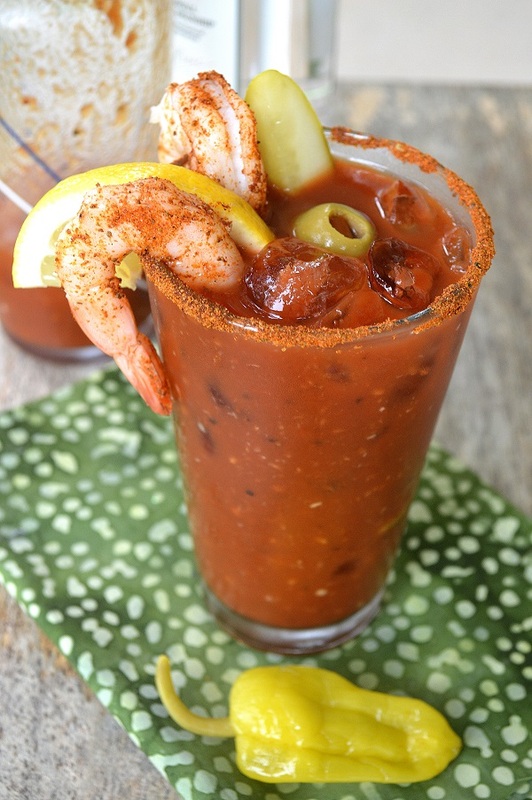 For most of my life, I refused to even taste a Bloody Mary. Gah! I can’t believe it! I would hang out with friends who would plan whole mornings around the ritual of Bloody Mary’s and never even consider taking a taste. I THOUGHT, I would hate them because of the tomato juice or the thickness…or something. I would think about it and say to myself…Colleen, you love tomatoes, vodka is your favorite spirit and you are crazy for good horseradish…maybe you would like them”. So one day I had a little taste. It wasn’t thick and nasty, it was like a symphony in my mouth! So many flavors, and spice and cool and refreshing. I had been missing out! The thing is…locally, at a neighborhood bar, a bartender we know (shout out to Shelly at Ralphies) makes her special Spicy Bloody Mary on Saturdays. That’s it just Saturdays. Each Bloody Mary that Shelly makes is a labor of love. She is the one who stops for the cocktail shrimp to grace each Bloody before she gets to work and then she crafts each one individually. 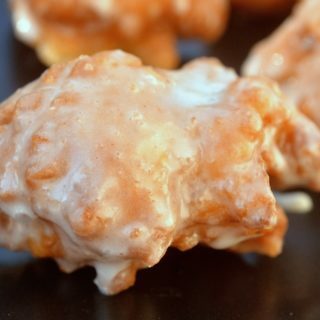 I have had 3 during a visit once or twice, they are just that good! Once one person orders one of Shelly’s Spicy Bloody Mary drinks, usually a few heads turn and a then instantly a few more orders get put in. 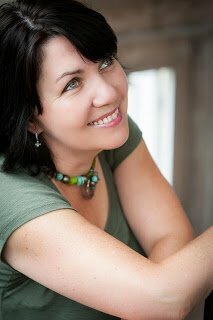 Shelly has “wrecked” me, my husband, my sister and so many others because usually, now any other Bloody Mary lets us down. Especially when you ask for a Spicy Bloody Mary…Some bartenders just add a bunch of Tobasco to the drink….Noooo! That’s awful, it’s like you are now drinking Tobasco. In my opinion, horseradish is the key to making a great Bloody IMO, and Kelchner’s is the BEST!!. Pickle juice is a great addition too especially if it’s from spicy pickles, mmmm! Is it Saturday yet?? I have nothing more to say about this other than…Make it! 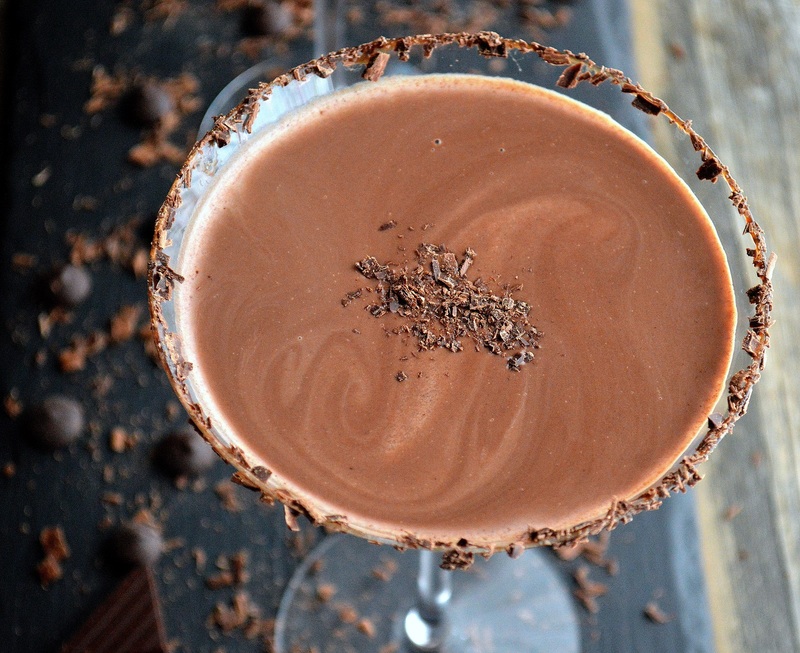 Chocolate Martini (THIS is the proper, decadent, chocolate martini of your dreams! 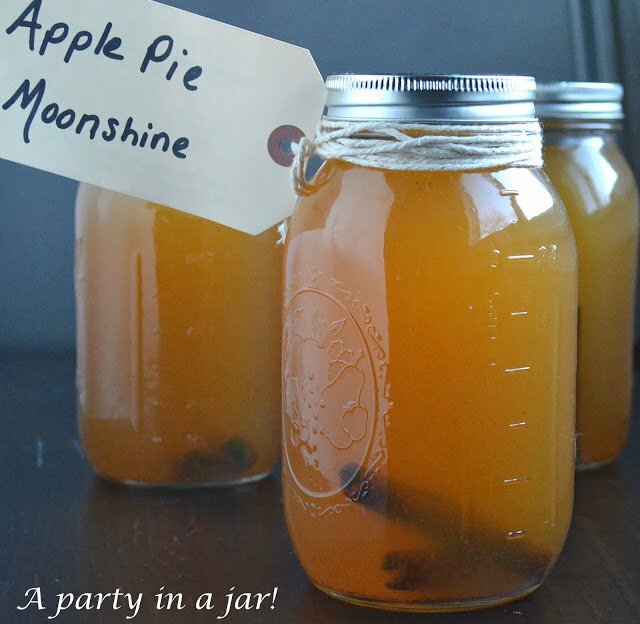 Or my “famous” Apple Pie Moonshine! It’s a party in a jar!! 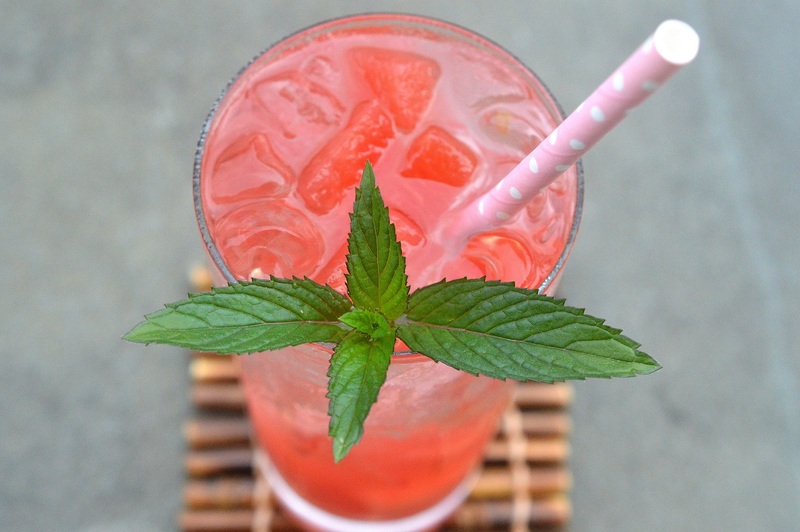 Or for summer, this super yummy Watermelon Vodka Cooler. 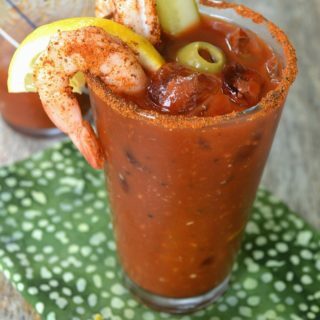 Additional Garnish: I also like to serve some homemade spicy cocktail sauce on the side for dipping the shrimp, I then will toss some in my Bloody too, it is SO good! Mix all of the ingredients together in a separate pitcher or container, stir it up well, and then pour mixture into your cocktail shaker, one batch at a time. Give it a good shaking to get it nice and cold, then pour the contents into your prepared glass. Slide in a pickle spear or stalk of celery, a few Old Bay seasoned shrimp, a couple of big fat olives, and you are good to go. 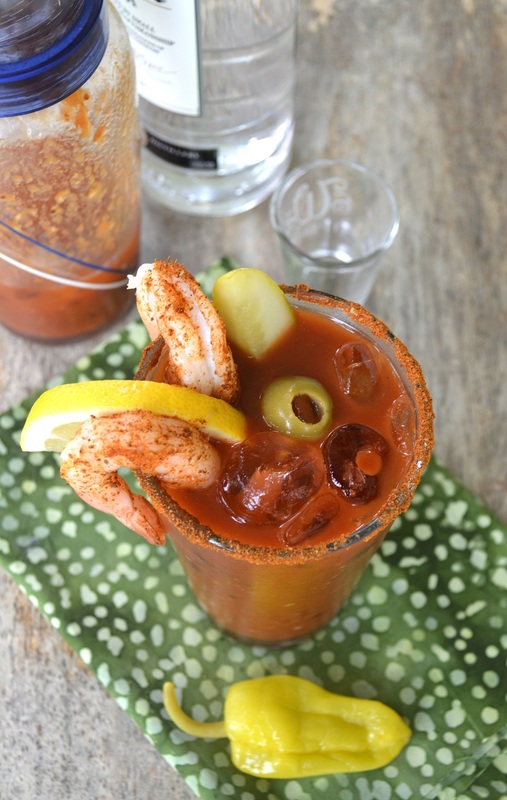 You can also add a lemon and or a lime slice, and if you’re feeling crazy add a whole pepperoncini to your Bloody, my husband and sister love this…Yum! A note about cocktail sauce. Never buy it, it really is never good, even if you think it's good, lol! Store-bought cocktail sauce is usually gelatinous. Blech! Instead, simple stir together ketchup and horseradish and if you wish a splash of Worcestershire sauce. Make it as spicy or mild as you wish...Me?? I want the taste of my cocktail sauce to go up my nose, behind my eyes and into my brain and go whaaaa! Then I taste it again! Mmmm! And my answer to that question… YES!! Heading over to check out the recipe now!! Not tomato juice!!! Motts Clamato juice is out of this world! You can get regular, spicy, the works, pickle, and or lime!! The best ceaser mix known to man!! Otherwise this is an AWESOME recipe!! This looks oh, so tasty! 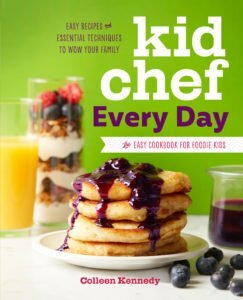 I'm heading over to get the recipe! What is the pepperoncion juice I have never hear of this ? I tried leave five stars but it would only let me check three ? I have heard of it! It sounds scrumptious and I need to give it a try! Thanks Barb! Could you please clarify how to make the shrimp? Do you just dust with Old Bay? All the rest is very clear, but I want to do it right! Thanks ! Hi M.J., I just use cocktail shrimp that was either already cooked or I cook it myself via boiling water. Then I dust it with a little Old Bay after it has been chilled icy cold. Cheers! I love a good dose of horseradish, and instead of regular Tabasco, I would use some Habanero Tabasco. Looks delicious. In Canada we call them Ceasar’s and we use Clamato Juice instead of Tomato Juice, so much tastier! What’s the better brand of Vodka to buy, when you get to the store there are to many to choose from. And how much do you add to your recipe?? I have really come to like Tito’s Vodka. It is smooth and if I have a couple of cocktails, no headache the next day (it also happens to be gluten-free…maybe that has something to do with it). Cheers! I decided to make this recipe for my Christmas Day cocktail. It is DELICIOUS! The Old Bay really makes all the other flavors really pop and tastes so good. Yay! So glad you enjoyed it! And thanks for letting me know. Cheers! Try using horseradish vodka!! Amazing! Whaaaat? I didn’t even know there was such a vodka! Will do…Yummmm! You can leave the horseradish out…with all he other spices, it will be delicious. 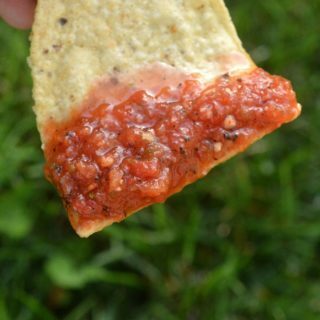 I make a delicious jalapeno sauce for fish tacos, etc. I used that in this recipe and it was very very nice. You could also add jalapeno juice instead of pickle juice to add some heat. Have a Merry Christmas! 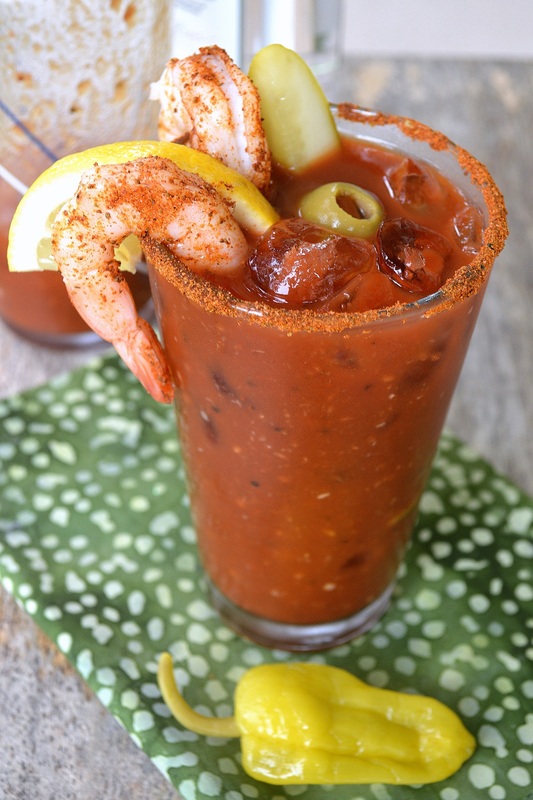 Do you add the old bay seasoning to the tomato juice mix or are you just using it for the rim of the glass and shrimp? Did you ever get an answer to this question? That was my first thought when I read the recipe also. What flavor/kind/brand of pickle juice do you recommend? I’ve not added that to a Bloody Mary before. I agree completely about the horseradish – so much more flavorful than just Tabasco. Hi Mary, I/we like “hot & spicy” pickle juice. I find them at farmers markets and a brand called Zayda’s is what I look for at food stores. Any spicy pickle juice will do. Cheers! You should Google St. Elmo’s Steak in Indianapolis, IN. 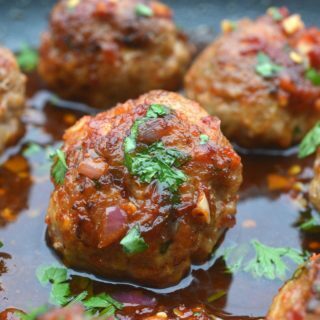 They make a cocktail sauce that will bring tears to your eyes and your sinuses will burn. It’s so popular they now bottle it and sell it retail. I’ve made almost exactly the same bloody mary for 15 years. I use Lime Twisted Gin instead of vodka. Just because I can’t stop at just one, and vodka always gives me a headache. I also add all the garnishes as well as pickled asparagus. Mmmm, sounds wonderful! I’ll have to try it with gin one day…I do like a G&T so I’ll bet I’d love it! Omg there’s horseradish vodka?! Where has this been my whole life? I love an extra spicy extra dirt Bloody Mary. Bring on the horseradish, heat and brine. Soo good! I totally agree with the homemade cocktail sauce. I even jazz it up with a little worstershire, lemon juice and garlic powder. I never buy it now because it is never the same! Great recipe! Thanks! I can’t find the recipe! Can you please send it to me? my e-mail is [email protected] or send me the link or something ……. why can’t I find it?? I am with you! The spicer the better! As long as the spicy isn’t from just Tabasco…I love Tabasco, but really don’t like when a place serves me a Bloody only spiced up with Tabasco…shudder! Ever try sriracha vodka …its great!! YES!!! It really IS good! A tablespoon of Horseradish! Jesus Mary and Joseph! Hahah! Luke’s in San Antonio got me hooked on horseradish in my Bloody Mary, they use large ball jars for theirs and might use an 1/8th of a teaspoon of HR and that has a nice kick but I’m thinking a tablespoon might burn your balls off! DOH!